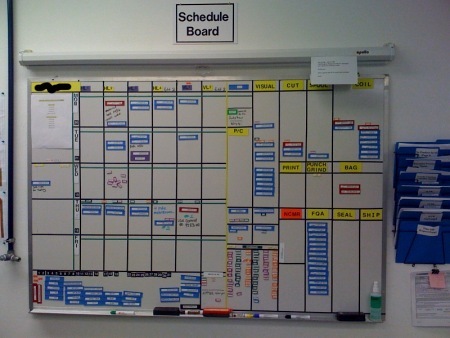 This week we have one example of a visual scheduling board from a company that has scrapped its shop floor MRP system. The various processes are in order on the board, and magnets represent basic job information. The operators have the responsibility to move the magnets, and they can also immediately react if any bottlenecks become visually apparent. What you don’t see: a webcam is aimed at the board so that the sales department always has access to the latest job status information. I would add one enhancement that I’ve seen at other companies: the board is laid out to look just like a process flowchart. I really like the idea of the webcam. If management gets really creative suppose they could invest in a full functional digital whiteboard. I love it ideas come out of the simplest things. I’ve read you praising this kind of low tech scheduling system. I have one better for you, when I worked at a large chemical coating plant we had a board with the schedule (we only had one large coater with three or four prep steps before it). The board was the hub of the operation. Every minute of the machine was accounted for in the board (PM, upgrades, etc). Any time there was any kind of disruption, everybody, from the plant manager to the floor guys gravitated towards the board to see the cascading effect of the event. The board started when the plant was first built in the early seventies and every time a new mrp system came along there was talk of eliminating the board, it never happened. This is great has anybody got any such examples for the service sector.